No more manual changeover switch or inconvenient extension leads, the Latronics High Speed AC Transfer Switch is a fool proof, hassle free solution for multiple power source systems. Fast input switching (transfer time of approx 12ms) ensures a smooth transparent transition between power sources. Indicators clearly display when each of the AC power sources and AC output power are available. The generator input also comes with voltage sensing and time delays to ensure the generator has warmed up and the voltage is stable before switching to generator power. The generator voltage is continuously monitored and in the unlikely event the generator voltage becomes unstable the device switches to another power source until the generator voltage restabilises. 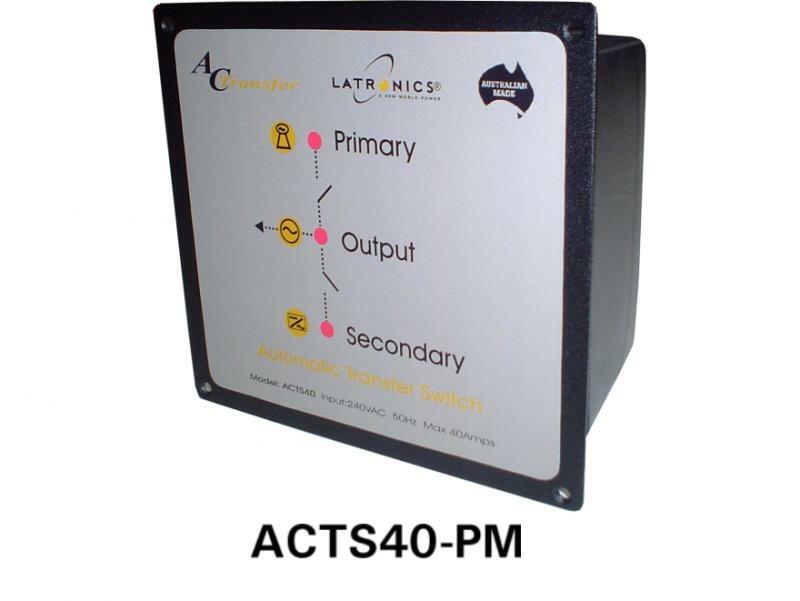 The surface mount model (ACTS40) has dust and low pressure water jet protection (from all directions) allows it to be installed almost anywhere around the system, without affecting its long term reliability. The panel mount model (ACTS40-PM) has a depth of only 65mm and can be mounted into switch board giving a more professional and tidy installation. 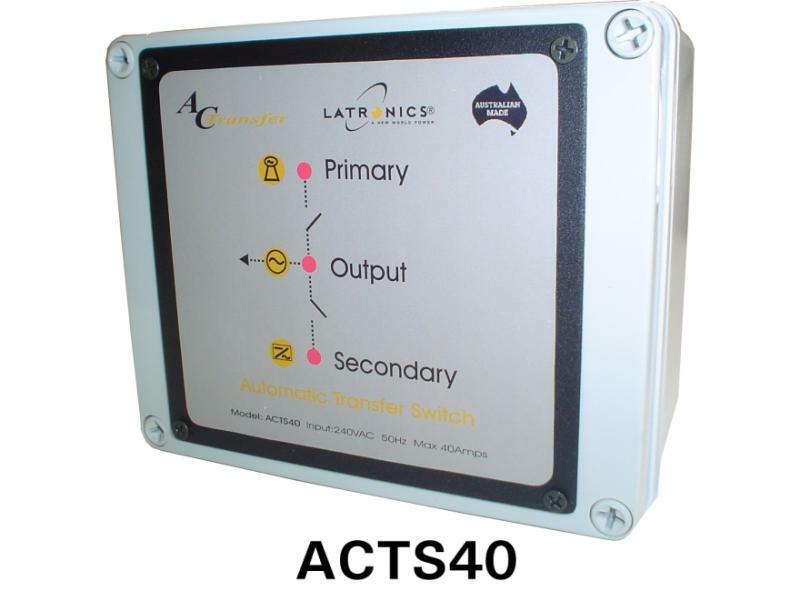 The ACTS40 can recognise a loss of power from your primary source and transfer to your back-up source of power in approximately 12ms. This giving you transparent and un-interrupted power transfer. Double pole relays switch both active and neutral to eliminate any earth or grounding problems and completely isolate each source. Minimises and simplifies your systems wiring, while providing a fully automatic system manager. Ensures the generator has warmed up and the output voltage has stablized before transfering power to the output. Monitors the generators output voltage and if it is too high or too low will transfer the output power back to inverter power until the generators output restabilises. Over 25 years of experience and continuous adherence to stringent quality standards ensures optium reliability backed with a full 2 year parts and labour warranty.